I liked the property. But when we got to our room, the bed was wet. The brought up clean blankets and sheets for me to change the bedding. Great stay with you. Only thing that I can mention that was a little annoying was the cable TV outfit that you use. Really liked everything else about our stay. Would stay with you again. Nice hot tub outside. Pool was open but chilly (March). Nice Workout room. Our room was clean and the breakfast was great. It was only 70 degrees when we were there, but the pool was heated and my kids had a great time. Just one night heading to another destination. Everything was great. They were very busy but the staff handled it wonderfully. The restaurant food was great and the service even better. Location and staff were the highlights. The room could have used more outlets. Liked that we were so close to the nice clean pool and the breakfast was wonderful. Clean, comfortable room. We would stay there again. A good, simple breakfast. St. George is a lovely city in Utah that was founded by Mormon pioneers. The area is geographically known for its rocky landscape formed from previous lava activity, the prominent Pine Mountains, and its proximity to the Mojave Desert. 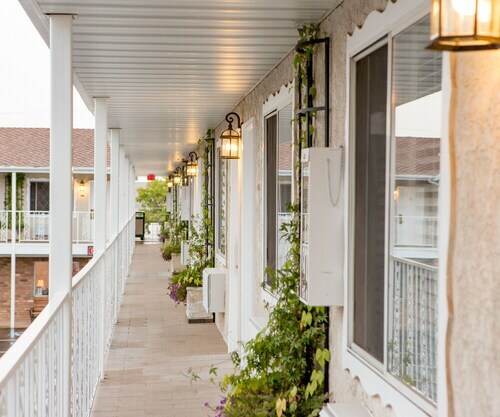 Anyone can find comfort in this area at inns and hotels in St. George such as the Seven Wives Inn, which offers bed and breakfast service, or somewhere more extravagant like the Coral Springs Resort. St. George has many artistic sites and locations full of local talent, such as the St. George Art Museum and the St. George Opera House located at the Pioneer Center for the Arts. Many local restaurants also house gallery pieces from local artists as well. Indulge yourself after your long tour of St. George at the Anasazi Steakhouse and Gallery with a juicy steak, or even at the Desert Dove Tea Room with cake in a glass. Visit the St. George Dinosaur Discovery Site at Johnson farm to experience a piece of history with well-preserved dinosaur footprints and tracks. 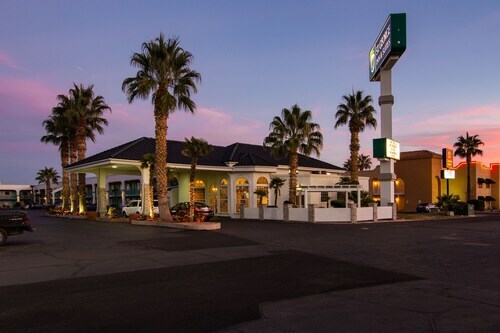 The Outlets at Zion hosts a wide variety of stores and shops where one can purchase clothing and souvenirs all in one place, and the Red Cliffs Mall offers not only clothing stores but refreshing restaurants and entertainment. The Dixie Center in St. George can house up to 5,000 people and is used for conventions and meetings while providing superior service, high quality catering, and prestigious treatment in a formal setting. Every unit has a kitchenette. The rooms seem recently remodeled. The location is central - walk to the historic center, dining as well as hiking trails/parks. I liked the room setup and cleanliness of the property.